I am a 50 (almost 51) year old woman and I am passionate about a lot of things, my family, the beach, good food and therefore working out, and equity. Notice I didn’t say equality. There is a common misconception that equity and equality mean the same thing — and that they can be used interchangeably, especially when talking about how people live. Yes, when talking about race. And gender, and class, but today I want to focus on race. But the truth is they do not — and cannot. Yes, the two words are similar, but the difference between them is crucial. 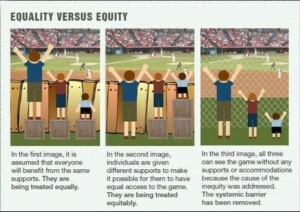 So please, don’t talk about equality when you really mean equity. I mean I can see how there is confusion about the words. They sound alike, they even mean similar things, but they are NOT the same. 1) Both words point towards treating people the same, with dignity and as people who have a voice, power and choice. 2) Both terms point towards a desire for every person to reach their full potential, not only to survive, but to thrive. 3) Both terms seek to reach a place where race, age, socioeconomic status, gender, mobility, sexual orientation, religion, or other differences do not determine access to education, resources, or decide one’s level of inclusion or well-being. However, the difference comes from the fact that we do not have a level playing field and everyone doesn’t start at the same place. Equality says that everyone has the same access to education and food and resources and housing and they all start at the same place as every one else and that just isn’t true. This is where equity comes in. Equity realizes that the systems of education, politics, health care, economics and power have been created in such a way that discrimination lives within them. In order to achieve equity, this systemic discrimination must be eradicated from the systems themselves. Equality says that the rules of the game are the same for everyone. Equity says that even if the rules of the game are the same for everyone, the game is “rigged” to provide some with more privilege at the expense of others. Equality says that everyone has the right to vote. Equality says we can eradicate racism by “doing no harm” based on race. Equity says we can only eradicate racism by doing no harm AS WELL AS actively working for justice by BOTH refusing to reproduce harms AND actively working to dismantle the causes of racial inequality. So when I hear people say (particularly on social media) that the world is equal and that everyone has the same opportunities they may be correct in using that word, but equality isn’t enough. 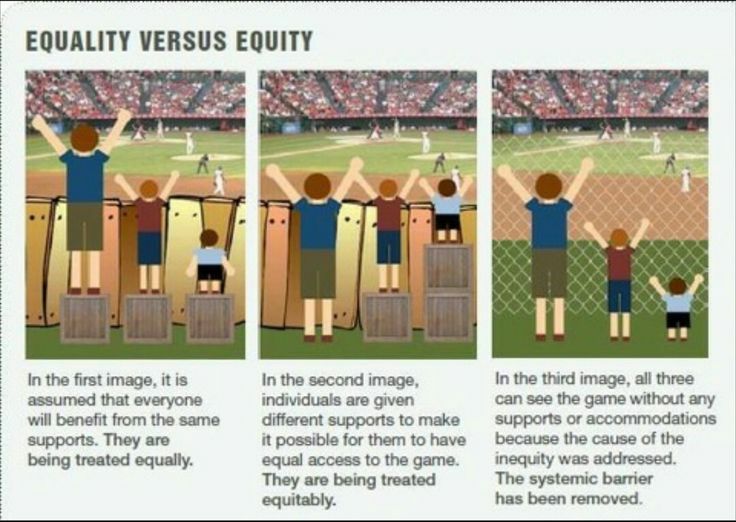 We need EQUITY. In the United States we do NOT have equity. Black males are incarcerated more than white males. We have had TWO more instances of black men being shot this week. Even if we aren’t sure about the man in Charlotte whether there was a weapon or not, in the case of Terence Crutcher even the Police Chief of Tulsa is saying there was no weapon. This man had his hands in the air. Equity would mean that if it is okay to shoot a terrorist suspect in the arm and leg to “take him down” then the same would hold for an unarmed black man be shot in the leg to “take him down” if the police think he is not complying and needs to be stopped. Equity would mean that if terrorists can be taken alive to face a trial and jury then so can a black person. We don’t need equality. We NEED equity! At approximately 8 am on the morning of April 12, a man named Freddie Gray was arrested by two Baltimore Police officers. He was placed into a police van, and although witnesses say he asked for help because he couldn’t breathe, he didn’t receive any medical help. The police van made 4 stops while driving to the station to book Freddie. When the van arrived at the police station at approximately 9:30 that same morning, Freddie Gray was unresponsive and was rushed by ambulance to a Trauma center, where he died a week later due to complications from a severed spine. 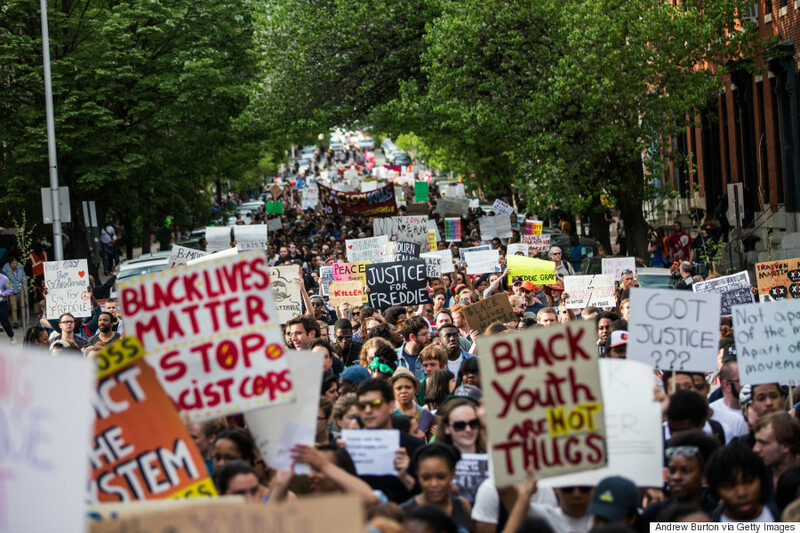 Freddie Gray’s funeral was held on April 25, and following his funeral riots broke out in Baltimore. I get the riots, I get the anger…. I am angry too!!! In my opinion, the riots were a response….an angry response…..to Freddie Gray’s death….his murder…….. and nothing being done to the officers who arrested him (murdered him), besides them being suspended from the Police Force while the matter was being investigated. When looked at in this way, the riots are at the most basic level, about an oppressed group being infuriated and tired of living in a society that doesn’t think that black lives are important. On April 27, reporter Ta-Nehisi Coates wrote in an article in The Atlantic, “When nonviolence is preached by the representatives of the state, while the state doles out heaps of violence to its citizens, it reveals itself to be a con” (Coates, The Atlantic). He is speaking about the politicians who were asking young people in Baltimore to remain peaceful and ‘nonviolent’. His point about that being a ‘con’ is well. In order to understand my perspective I need to introduce you to a word: hegemony. This is really what is at the base of racism, sexism, homophobia, and every other “ism” I can think of, and a word that needs to be understood. Once people understand what Hegemony really means, they usually have an “a-ha” moment. In this context it is obvious to see Ta-Nehisi’s point, (which I agree with), that the “representatives” of the state who are asking the people of Baltimore to act in a nonviolent manner are themselves the ones who are the oppressors, and therefore the perpetrators of the violence. Police, who have authoritarian power over society, are group that uses that power in a way that is unequal with society as a whole. In other words, if minorities, and in this case a young black man, is arrested and subsequently dies, the police, while being culpable, are not held accountable, because that does not fit within the idea of “hegemony”, which are the societal standards that are the norm within American culture. In fact, when a group is disenfranchised, and oppressed, and not allowed to prosper by the dominant group, it is inevitable that the inequality would cause violence. By asking for this group to act in a “nonviolent” way, the state representatives are asking them to be okay with their disenfranchisement and oppression. That is only going to lead to more anger and more violence. The only way to move forward as a society is to remove the hegemony (and the white dominance) that our society is structured around and create a level playing field for all. Remove the oppressive institutions, derail racism, and allow access to quality education, safe shelter, and healthy food to all members of the society. Not just the ones who have enough money to afford those things. If they were accessible to all, society as a whole would benefit, and America would indeed be the world power it claims to be. I agree with Ta-Nehisi’s tweet about rioting: It is an expression of anger. Some humans riot because their school lost the big game. Others because the State can’t stop killing them.